Get the salary you want:Shew. You finally have an offer on the table, and you're so excited you could just scream. But now that you've jumped through the hoops to get to this point, the real work is still ahead of you. It's time for negotiations. Typically I think there are two types of people – those who love to intellectually spar and those who would rather play rock, paper, scissors instead. Luckily, you can overcome that aversion to negotiating by preparing yourself for what becomes crucial to you in a new job and what becomes more of a “nice to have." As R. William Holland states in his book, you get what you negotiate for, not what you deserve. What's important to take away from that is you don't have a third-party fighting for your interests; you must muster up the gusto and self-awareness to enter into negotiations as a skillful opponent. “Today, negotiation skills are an absolute necessity for successful career management," says R. William Holland in his book “Cracking the New Job Market." Most of us go through what he terms the “postoffer honeymoon" where we're so elated that we just blindly accept the offer without knowing that we have every right to accept it and review it. “The truth is that you are in your strongest bargaining position during the time between when a job is offered and when you accept it." However, you need to determine your list of desirable characteristics from the job in order to effectively negotiate. If you have unrealistic expectations, you can muck things up quite a bit. Holland suggests listing out ALL of these requirements and then categorizing them equally (because, as The Rolling Stones have taught us all, you can't always get what you want) between the groups of “must-haves," “like to have" and “can live without." Some also make the mistake of playing this card too soon in the interview process. If you go in saying that you need to make a certain dollar amount or work from home two days a week, an employer may see you as more trouble than what you're worth. The key is to go in and let the interviewer see your value. If you're offered the position, THEN you can negotiate. Once you've wowed the interviewer, he or she will be much more willing to compromise to satisfy your needs. If there are certain things that are crucial for you and are automatic deal-breakers, casually ask about them during the interview process (i.e., the work-life balance leading to the work at home question). Don't turn down a job before it's offered: Titles, salary levels and review increments can all be negotiated, so don't turn down interviews for certain positions if you think they're “below" you. Get an offer in writing before you do anything drastic: Don't announce your resignation until you have your hands on this letter. Read it over carefully and measure it up against your list of “must-haves." Don't haggle over everything: Again, go back to your list of things that you can do without and concede on those gracefully. Don't forget you're only human: In interviews, you usually try to knock the socks off of the interviewer and your potential employer, but once you go into negotiations, don't let your head get too big. Set yourself up to underpromise and overdeliver. Stalemate: This happens when you both don't want to give up any room. If these negotiations drag out, you are in a bad situation; be prepared to come up with alternative bargaining chips should you hit a wall on a certain item. I win/you lose or you win/I lose: This is when both sides see a gain for one as a loss for the other; remember to go back to your list of “like to have" and see what you are willing to concede. I win/you win: This happens when both parties find mutual ground to agree upon and feel they each get enough of what they want to walk away pleased. This creates a solid foundation for building a positive relationship if you are to take the job. The long and short of it? List out your expectations and then take a good, hard look to see what's a necessity and what's just icing on the cake. Best case scenario, everyone walks away happy and ready to start working together. What other tips do you have when it comes to figuring out your list of job requirements? Have you sold yourself short in negotiations, and how did that affect your job? 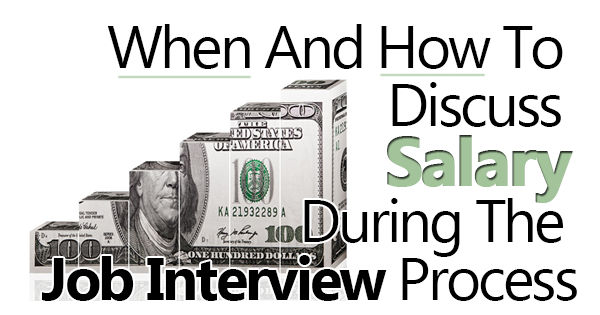 0 Response to "How to negotiate your salary during the interview"